Pioneer in research. Expert in health. Supports brain function. Naturally sourced omega-3 with omega-6.Supports brain function* *DHA contributes to maintenance of normal brain function. The beneficial effect is obtained with a daily intake of 250mg of DHA. 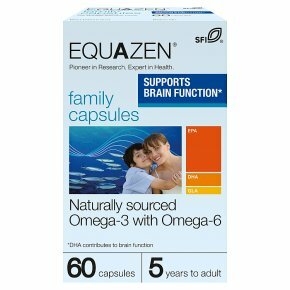 Provided by nature, blended by experts Equazen®family is an easy and convenient way to get a balanced intake of Omega-3 and Omega-6. Only high-quality natural ingredients are used to produced Equazen®. Our oil comes from sustainable sources of oily fish, such as sardines, renowned for their naturally higher level of EPA. Independent testing ensures our oils comply with stringent EC purity rules. Equabalance\ ratio This specific combination of Omega-3 EPA and DHA together with Omega-6 GLA ensures a synergistic and balanced formulation to meet the body's individualneeds.